Caramels are melted inside cored apples to make this tasty twist on classic caramel apples on a stick. Grab a fork and dig in! Use sharp knife or apple corer to remove core to within 1/2 inch from bottom of each apple. Partially cut each cored apple into 8 wedges. 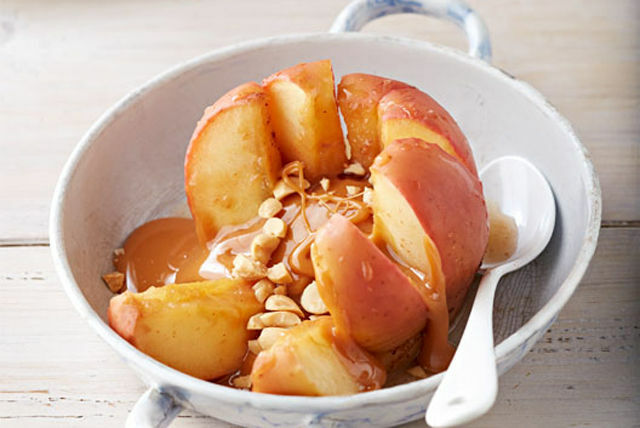 Stand each apple on large sheet of heavy-duty foil; place 3 caramels in centre of each apple. Mix apple juice, sugar and cinnamon until blended; pour over apples. Wrap apples in foil to make 4 packets. Grill, top sides up, 15 to 20 min. or until apples are tender. Cut slits in foil to release steam before opening packets. Sprinkle nuts over apples. If you don't have heavy-duty foil to make the foil packets, you can use double layers of regular foil instead. Rearrange foil packets on barbecue occasionally during the 20-min. grilling time, if necessary, to prevent the ingredients in packets from burning.